First-generation security intelligence and security incident and event management products have promised a lot, but some of these tools require considerable resources to manage the solution. The growth in security-as-a-service offerings, however, offers an opportunity for information security teams to follow the path successfully laid by many other IT departments. 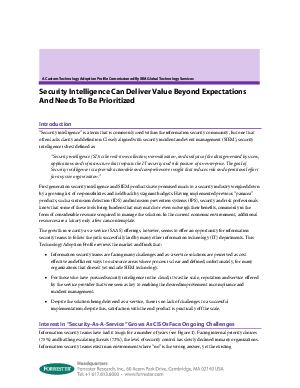 Read this white paper, “Security intelligence can deliver value beyond expectations and needs to be prioritized” for an overview of market adoption of security-as-a-service.